Karachi is the cultural, economic, philanthropic and educational hub of the country. The city feels the pride of hosting IDEAS series of events since 2000. Karachi is the largest city in Pakistan. Located on the coast of the Arabian Sea, north-west of the Indus River Delta. It is considered as the cultural, economic, philanthropic, educational, and political hub of the country. The metropolitan area along with its suburbs comprises the world's second most populated city, spread over 3,530 square Kilometres. The city credits its growth to the mixed populations from different national, provincial, and linguistic origins. It is locally termed as the City of Lights for its liveliness and vibrant lifestyle. Karachi is home to some of Pakistan's important cultural institutions. The National Academy of Performing Arts offers diploma courses in performing arts that include classical music and contemporary theatre. The Kara Film Festival annually showcases independent Pakistani and international films and documentaries. 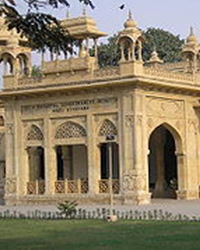 Karachi has many museums including National Museum of Pakistan and Mohatta Palace. The culture of Karachi is characterized by the blending of South Asian, Middle Eastern, Central Asian and Western influences, as well as its status as a major international business centre. Karachi hosts the largest middle-class stratum of the country and is the most liberal city in Pakistan. 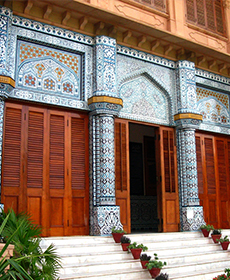 Karachi has a rich collection of buildings and structures of varied architectural styles. The downtown districts of the city contain a variety of early 20th - century architecture, ranging in style from the neo-classical KPT building to the Sindh High Court Building. During the period of British rule, classical architecture was preferred for monuments of the and Karachi acquired its first neo-Gothic buildings when Frere Hall, Empress Market and St. Patrick's Cathedral were completed. In recent years, a large number of architecturally distinctive, even eccentric buildings have sprung up throughout Karachi. Notable examples include the Habib Bank Plaza, Ocean Mall and the MCB Tower which is the tallest skyscraper in Pakistan. Many modern high-rise buildings are rapidly under construction.